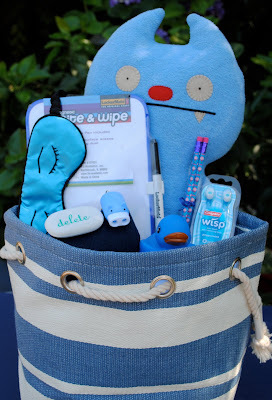 We filled this care package with everything in a blue hue! okay seriously you come up with the best ideas!! you are such a FUN mom! LOVE it!! OK, I am thinking I must get up early, hitthe store and make a cute package for my little guy...asap! Your daughter's bunkmatesare going to be seriously envious!